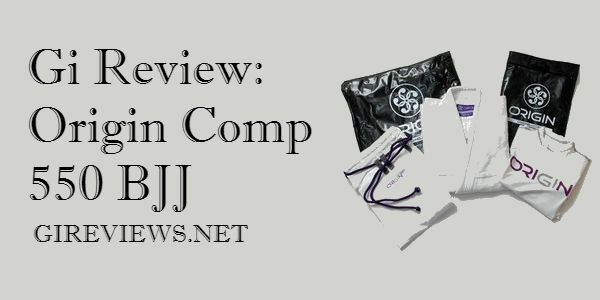 This is my first “formal” gi review, so input would be greatly appreciated. For the record, I ordered this Origin Comp 550directly from Origin in A4, which is my size in most gis. Origin is a new company out of Maine; the Origin Comp 550 is their second gi ever, and their first going on an extended production run. Their first gi, the Genesis 550, was a limited edition. I’m 6’0″ and usually hover around 260 lbs. I have a 46″ chest, a 38″ waist, and a 32″ inseam (in most pants). I have longer arms due to broad shoulders, taking a size 36-37 in dress shirt sleeves. This is how the Origin Comp 550 gi looks on me after 3 washes in cold water, always air dried. First, I’ll address the Origin Comp 550 jacket. The top is the now popular one-piece construction using 550 gpm pearl weave. It’s the lightest gi I’ve owned thus far fabric-wise so I was a little apprehensive about its ability to withstand abuse. After rolling in it for about six or seven hours over the course of a few classes, it’s held up well and the weave seems tight. I generally like the fit, although I’m not used to an A4 gi having this much lapel overlap, so it actually feels warmer when rolling than my Atama Mundial 9. The lapel is sturdy, but not overly stiff. Thickness is on par with my Atama. There are a few quality control issues I’ve had with the Origin Comp 550 gi top. The first thing I noticed when I first put the gi on was a rather obvious sloppy job done in the contrast stitching on the front of the gi, where the left seam meets the lapel. It seems that the seamstress assembling the gi ran out of thread with about three inches left and did a hatchet job trying to finish off the seam, including doubling back a few times, but not in line with the rest of the stitching. I had a seamstress attempt to clean this up (it was cheaper than shipping it back to Origin), and she did, but it doesn’t look 100% correct. I think it’s very important to note that (as I explain in greater detail below), I brought this defect to the attention of Pete Roberts, the owner of Origin, and he offered to exchange it, but I chose to have it repaired instead. I also understand the circumstances under which this happened — Pete received his shipment from his suppliers and sent them out to customers who had been waiting on their pre-orders. I’ve never had anything but positive interactions with Pete regarding his customer service. On the right side, one of the lines of thread actually runs off the seam for the shoulder reinforcement piece for about 1/2″ before getting back on it. This defect is not visible from the outside of the gi and does not create any type of structural integrity problem I can detect. There are also two small areas on the gi where the weave looks a bit feathered, showing more wear than the gi actually has. This is only visible on close inspection, however. Now onto the pants. Unlike Meerkatsu, I found the Origin Comp 550 pants to be a bit too long out of the bag, although I had the same problem with the ridiculously long pant rope. I cut it and melted the ends, which are starting to get a little frayed after three washes. It took two washes to get rid of the funky vinyl smell. The weight of the pants feel-wise is between a heavier ripstop and a solid canvas. Construction of the reinforced knee panels is solid — feels like there are at least three layers of fabric there — but they should be a bit longer. I find that my knee is right under the edge of the end of the reinforced area most of the time. The crotch is a panel of gi fabric, akin to what you’d find in a Shoyoroll. Fortunately, I haven’t found any quality control issues with the pants specifically. You might want to consider these pearl weave gis available at Hypnotik! As far as actually rolling in them, I have a difficult time with my legs wanting to move around inside the pants, which is…well…weird since they’re not tight anywhere, but I do occasionally have to make a conscious effort to pull them up a bit to achieve more range of motion. This has improved with each wash, though, so it will probably become a non-issue in the near future. Because of the weight of the material they also hold sweat (which I do, profusely). Case in point, I rode home from BJJ one night on my motorcycle wearing my gi pants. After a 30 minute trip, including 15 minutes on a highway doing usual highway speeds, my gi pants were still damp when I arrived home. Since Origin includes a rashguard with your Origin Comp 500 gi, it would be an incomplete review without talking about it. As far as fit goes, with my generous proportions, the body of the rashguard fit snugly, but the sleeves remained relatively loose. The overall feel of the material is silky, so it moves well inside the gi. Couple things I don’t like about it, though.First, the material — even the black version — is see-through when stretched. That means on me you can see my ample Italian/Eastern European mutt body hair through the rashguard. The fabric is also thin. In short, I would not wear this by itself for no-gi training.Second, although the stitching is aesthetically pleasing, expect a chain reaction if the threads start coming loose. I noticed this in the wrist of the rashguard after one washing. The top of the stitching pattern is held together by a continuous thread on the inside holding loops into place. This thread goes, and the loops all pop out. Again, a very pretty design, but I don’t feel it’s going to hold over the long-term. Finally, I’m going to address Origin’s customer service. I’ve always thought that customer service can never be measured by how a company gets things right, but how they handle things when they go wrong. Every email I sent to Pete Roberts was answered within a few hours, and some within a few minutes. I let him know that I had a stitching problem with my gi, and he told me that he didn’t have any in inventory and wasn’t expecting another shipment of A4s in for another 6 weeks or so, but he’d be willing to swap my defective Origin Comp 550 gi for his personal gi that he’d worn once (Pete also wears an A4, which probably explains why he made a gi that fits a big guy so well). So I want to go on record as saying that I could have exchanged the gi, but decided because I didn’t want to take his and I was too impatient to wait for his new order to come in. Pete Roberts’ customer service is top notch, and the guy wants to make his customers happy. All-in-all, I feel like the Origin Comp 550 is a good gi that will last me at least a couple years in rotation. The purple and gray on black motif is stunning. I get all sorts of complements from the guys I roll with on it. The fit is very good in a A4 for a guy my size, especially with the jacket, although I will have to shrink the pants to get them the way I like them. However, as discussed above, there are quality control issues on the manufacturing level that keeps the Origin Comp 550 from being a *great* gi, and I’m not a fan of the rashguard. These BJJ gis are perfect for those with a lanky build! Now that I’ve owned the gi for several months, I have a few more comments. As of now, the pants fit fine with the legs stopping right at about ankle height, although the reinforcement in the knee makes them not move around on my legs as freely as other gi pants I’ve worn (primarily Atama brand, both the canvas and ripstop versions). I find myself hiking them up a lot so I can get full mobility. In terms of the quality control problems, I’ve had no other issues. The gi has held up great in terms of durability, including rolling with opponents who are almost 300 lbs. and have gorilla-strength grips. I do find that the skirt runs a bit short on me, so the lapel popping out of my belt has been a mild annoyance. Also, the extra room I have in the torso makes it a bit easier for opponents who have a deep collar grip to pull the gi up over my head. I still keep the rashguard in my rotation and haven’t had any further problems with it coming unraveled.